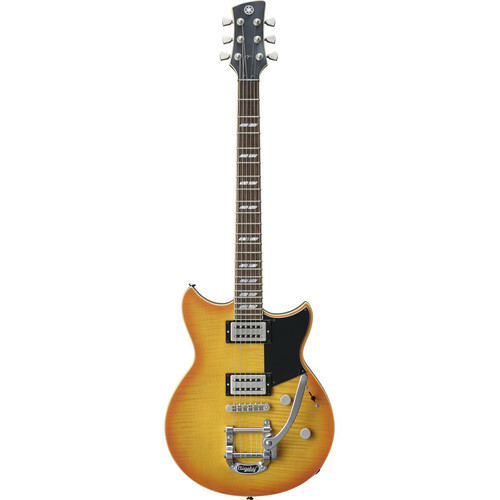 Styled in a wall fade finish, the Yamaha Revstar RS720B is a solid-body electric guitar sporting a double-cutaway design with a small pickguard, a mahogany body with a flame-maple top. A 22-fret rosewood fingerboard sits atop the mahogany neck, and the strings are held in place by a tune-o-matic bridge and Bigsby B50 vibrato tailpiece. The body features a hidden forearm contour, a deep belly cut, and neck joint which allows for easier upper-fret access. For electronics, the RS720B is fitted with a pair of custom-wound VT5n+ and VT5b+ Alnico V vintage-output humbucking pickups with satin nickel covers, along with a 3-way selector switch, and dual controls for master volume and master tone. The tone knob includes a push/pull dry switch, which filters out low frequencies to bring out the punch and clarity of a true single-coil pickup without the hum or hollow tone often associated with split humbucking pickups. Box Dimensions (LxWxH) 41.25 x 19.25 x 5.5"